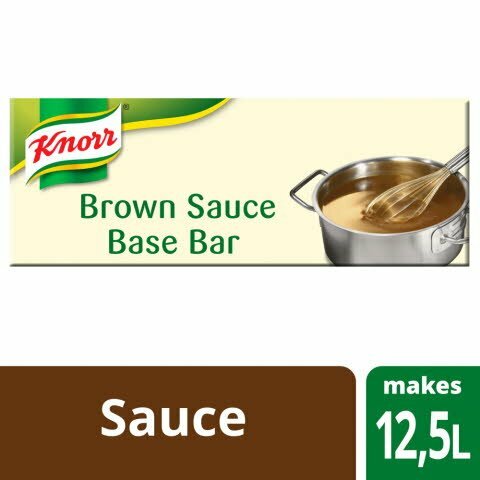 Create a delicious brown base sauce with KNORR Garde d'Or Brown Sauce Base. The Sauce base fits perfectly into your foodservice as it is easily prepared, and has no added MSG or preservatives. Ingredients: Vegetable fats (palm, coconut), modified maize starch, rapeseed oil, salt, flavourings, maltodextrin, colours (E150c, paprika extract), beef extract (1.7%), emulsifiers (sunflower lecithin, mono- and diglycerides of fatty acids), sugar, thickeners (guar gum, locust bean gum, xanthan gum). Add Brown Base Sauce to hot or cold water as per product to water ratio show on the pack. Bring to the boil and simmer for 1 to 2 minutes, stirring occassionally. SAUCE BASE IN BLOCKS - Perfect for providing a high quality volume base e.g. for conferences. - Unique and innovative format  simply cut like butter. - Quick and easy to use  reduces preparation and cooking times. - Large portionable pack to allow for perfect cost control. - Provide great flexibility for menu creation. - Cook chill stable, freeze-thaw and bain-marie stable. Store in a cool, dry place. Use within one month of opening.